21 miles. 3046ft up. 3523ft down. In contrast to yesterday I slept terribly. I had the craziest dreams, where I would wake myself up because they were getting so odd. And it was cold, by far the coldest night, it was below freezing and the wind was blowing all night, we were slightly sheltered by the trees. I could feel cold spots on my hips where my body was pressing against the sleeping bag, it will continue to get cold through the Sierra and I have a few layers to go yet so I should be ok. Thankfully nothing is wet. I reluctantly get out of my bag and put all my layers on. I really didn’t want to take my sleep clothes off but I just had to do it really quickly. I had my gloves on but by the time I had packed everything up my fingers were so painful. My water was too cold to drink and I bit into my chewy cereal bar and it snapped, that took me by surprise, as did the continuing upward momentum of the part left in my hand as it scraped across my cheek. I get moving as quick as I can, my hands hurt so I stick them in my pockets. But they aren’t warming up so I remember something about mittens being more effective than having your fingers separated so I ball my fingers into the palm of the glove. That helps but it still takes a good hour for my hands to feel anywhere near normal. I am moving really slowly because the trail is rocky and if I slip or trip I have no way of saving myself. Catwater catches me up and seems a little surprised I’m moving so slowly. I don’t feel that great, maybe it’s the altitude. The skies were clear blue and glorious, but the air was freezing, and when the wind blew it hurt my face. I had everything on except my sleep clothes and I was warm, apart from my face which was freezing. And of course my nose was like a dripping tap – annoying. I continued to plod on, eventually finding second gear and moving a bit faster. It was a couple of hours before I could take a layer off, I took off my big puffy but kept everything else on. In the sun it was warm, and my hood would come off, but as soon as I went into the shade which was regularly, the hood went back on. And so it continued all day. Hood on. Hood off. Hood on. Hood off. I went by Fontanillis lake and there were patches of ice in the shallow parts. Even the climb up to Dicks Pass didn’t warm me up enough to take any layers off. The wind was bitter. It hurt my face and stung my eyes. The air was so cold that at 11am I could still see my breath. But the climb went fairly quickly and before I knew it I was at the top. Just a little way down the other side is a great view of Dicks lake and I took a moment there to think about Janet. I got to a stream and I was able to get some decent water, I chucked out the remaining half litre of gross lake water I had been carrying and got a litre of fresh water from the stream, it was so cold it gave me brain freeze. On the way down I saw a woman and three guys, the guys had all they hiked in 1977. It was cool to talk to them. I passed a guy who said there is a 40% chance of rain in the forecast today, I have been watching the clouds gathering over the mountains. I hope the rain stays away. The sun finally gathered enough strength so I was able to strip all the way down to my basic hiking clothes. The wind was still cold but I was determined to carry on without putting my layers back on. I went passed Suzie lake and spoke to some guys (who had the most gorgeous dog called Noodle, I think it was a golden retriever, and it had its own rucksack. I say it because I don’t know if it was a boy or girl) and they tell me it’s going to snow today. About 5 minutes after I spoke to them the clouds had gathered a lot more so I layered up. As I went passed Heather lake the clouds were looking more and more threatening, and the temperature had dropped significantly and the wind had gotten up. Not a great combo! And then, it started to snow. Just lightly to start with, a few blobs floating around in the sky but as I climbed up and around the trail to Aloha lake it really started to come down. I took shelter under a tree and got my waterproofs back on. No matter which way you walk when it’s snowing the snow is always blowing in your face. I was waking away from the snow and as I came round a corner there was a man there who I said hello to and he asked me if I needed a cup of tea. He obviously guessed I was British and he was British too. But having lived in California since the 70s he sounded pretty American. I sat on a rock and had a chat with him about places in England and how his aunt lives just up the road from me. I chatted to him until Catwater caught up. Nice fellow. We hiked on as the weather rolled in and it really began to snow. At one point I missed a junction and we went about .2 out of our way until I thought the path didn’t look very PCT like and we had to turn around and go back. The trail was really rocky and they were super slippery now they were wet. I was checking the GPS and I slipped and fell straight onto my knees. That hurt quite a bit. We carried on into the snow, which was on and off with the wind. We saw a few more day hikers coming up into the weather as we were descending into Echo lake. There is a steep rocky section that we moved slowly through. Everything is tense as you are trying not to fall over. There was a tiny log across the trail and I managed to bash my shin really hard on it as I tried to step over it. It was so painful it brought tears to my eyes but I carried on through it. My legs were really aching now and I could feel some skin rubbing against my trousers. I must have cut myself. We carried on and on and eventually after what seemed like an absolute age we made it to shores of Echo lake, but there was still about 2 more miles to go the the other end of the lake. The resort os closed, we were hoping to get a sandwich an a soda there but after seeing a comment on our navigation app we knew it was going to be closed. I passed my future home I saw last year but sadly it looks a bit neglected. So I will just have to look for another one, there seem to be plenty to choose from around the lake! My hood kept going on and off and the wind picked up. We had done 21 miles and we were aiming for 26. It was 5pm and we didn’t have another 5 miles in us. We also had no water, and in a planning mistake we saw there was no water for 11 more miles. Of course Echo Lake was right there, but they say not to get water from the lake because of all the motor boats that go up and down. 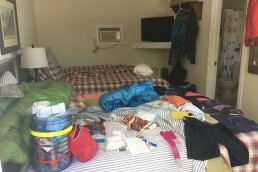 We could have camped there, I would have eaten a no cook dinner and survived on the three quarters of a litre of juice I had left, but Catwater likes comfort, in her words ‘I don’t like to suffer’, so she decided to try and hitch to South Lake Tahoe. I wasn’t going to disagree because that meant real food and I wasn’t feeling spectacular. She tried the guys we had seen coming down the trail but they didn’t have room, so she stuck out her thumb for the only other car. The man stopped and said he wasn’t going that way but he would take us to the ‘y’ anyway. He took pity on us. He ended up taking us all the way to the hotel Catwater booked while she was in the car. He was a nice guy, a Kiwi, so obviously we spoke about New Zealand, and he does a lot of maintenance on the 150 properties around the lake. 150! We went straight out for something to eat. I had Mahi and chips and it was delicious. I ate every single last scrap. And I had a couple of sodas of course. My face felt like it was on fire and I went to the bathroom and looked in the mirror. It was glowing. Wind burn. Showered – I did debate whether I actually needed one, I didn’t feel that dirty! But it was a good decision in the end because it was a good shower which nice products and it warmed me up (and I found out I had cut my legs and bruised my knee). Full belly. Warm dry bed. Thank you Catwater! That area in nice sunny weather is very beautiful. On our trip this past summer we picked that same house as our lake cabin.